In the lead up to COP climate talks in Bonn, the launch of a Green Climate Fund-financed US$65 million project signals strong global support for climate-resilient development in Small Island Developing States. October 25 2017, Apia - The Government of Samoa, with the support of the United Nations Development Programme (UNDP) and Green Climate Fund, has launched a new climate change adaptation project that will benefit nearly 30 percent of the population. Led by the Ministry of Finance, the US$65 million project focuses on building resilience to increasingly intense weather events driven by climate change. Small, remote, and with population and infrastructure concentrated in low-lying coastal areas, Samoa is extremely vulnerable to the impacts of climate change. Despite contributing little to the drivers, the Small Island Developing State is grappling with the impacts of a warming planet, including more frequent and intense tropical storms, sea-level rise and significant variability in rainfall. Urban infrastructure in Samoa has suffered considerably from the recurrence of flooding. 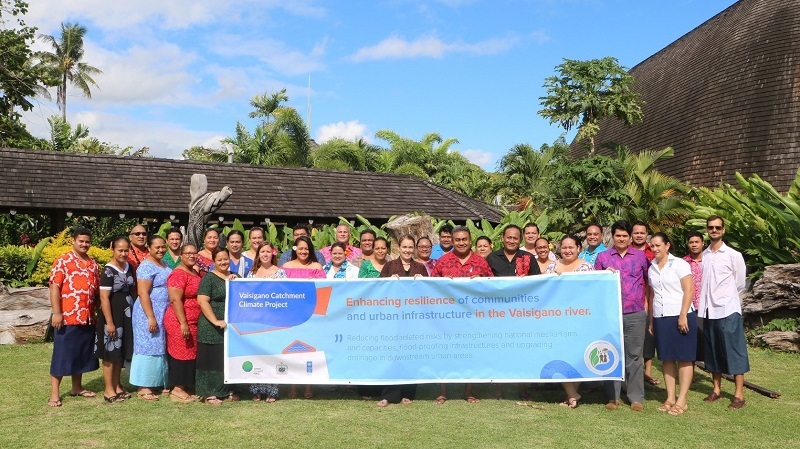 With US$57.7 million from the Green Climate Fund and US$8 million from the Government of Samoa, a new project will lay the foundations for Samoa’s comprehensive programme on climate change-induced flood management. While investing in flood-proofing infrastructure in the flood-prone river catchments of the capital Apia – including drainage and sewerage systems, river floodwalls and bridges – the project will establish a health surveillance system to track flood-related health issues, help institute better building practices and expand the coverage of early warning systems. Currently early warning systems, though well advanced, cover only tsunamis and earthquakes, and there is no system in place to warn communities along the Vaisigano River that they are at risk of an extreme flood event. A range of partners involved in the design of the project will also will be involved in implementation, from government ministries to builders associations and community-based organizations. Non-government organizations will provide training, monitoring, and mentoring of villages. "Protecting lives and assets against climate change and natural disasters is a national priority. The Government is very grateful to the Green Climate Fund and UNDP for supporting the Vaisigano Catchment Climate project, and had directed key government agencies and all stakeholders to enhance collaboration. The lessons learned from this experience will be shared and piloted with other affected communities maximizing benefits to the whole country" said Ulu Bismarck, Chief Executive Officer of the Ministry of Natural Resources and Environment. At the launch event and accompanying workshop with key stakeholders, Chief Executive Officer of the Ministry of Finance, Lavea Tupa'imatuna lulai Lavea, emphasized the importance of strong planning and impact monitoring, saying, "The purpose of today's workshop is to lay down a plan and validate indicators for the duration of the project." In 2012, Category 3 Cyclone Evan devastated livelihoods and assets, undoing years of economic gains in infrastructure development. According to the Post Disaster Needs Assessment, undertaken by the Government of Samoa with the assistance of the World Bank, the total damages were estimated to be approximately US$200 million, with a further US$70 million required for rebuilding human capital. By comparison, in 2012, Samoa’s Gross Domestic Product (GDP) was estimated to be US$683.7 million. Taking this into account, the total impact of Cyclone Evan was 40 percent of national GDP. Approved by the Green Climate Fund in December 2016 and launched in late August by the Minister of Finance, the project officially starts implementation this week. The project design was supported by the Governments of New Zealand and Australia. The Green Climate Fund was established by the 194 parties to the UN Framework Convention on Climate Change (UNFCCC) and given the mandate to fund climate action to limit greenhouse gas emissions and support climate-resilient development.